HOLLYWOOD, Calif. - Sept. 21, 2017 - PRLog -- Award-winning Gregory Blair's horror/comedy GARDEN PARTY MASSACRE picks up another win: this time in the Hollywood Independent Filmmaker Awards Festival. The film has been honored with an award for "Narrative Feature: Comedy". This makes the fifth award earned by the film to date. "I'm thrilled to be a part of a festival so lovingly devoted to the smaller, independent filmmaking community," Blair said. "So much of the business is obsessed with numbers—the bigger the better; it's nice to have an event that celebrates humbler—and often more heartfelt—cinematic achievements." The Hollywood Independent Filmmaker Awards Festival makes its inaugural debut as an IMDb qualifying event this year with red carpet screenings, filmmaker Q&A's and more. The festival's mission is to showcase small, independent films; their website proudly states "We are dedicated to finding those 'hidden gems'". GARDEN PARTY MASSCARE, Blair's follow-up to his much-lauded DEADLY REVISIONS, is a fast-paced, wacky spoof in the vein of Shaun of the Dead and Tucker and Dale vs. Evil. The fun begins when a friendly backyard gathering goes hilariously awry as an unexpected guest arrives. With a pickaxe. And an attitude. It's a screwball brew of murder, mirth and mayhem that critics have hailed "Hilarious! ", "Brilliant!" and "A Comedic Romp!" (Search My Trash Filmsite, The Movie Sleuth and Geek Nerdery, respectively). GARDEN PARTY MASSACRE has already won two Los Angeles Academy of Film Awards for "Outstanding Horror/Comedy Feature" and "Outstanding Ensemble" as well as "Best Comedy" from the Artists and Aliens Film Festival and "Best Film" from the Lucky Strike Film Festival. It is also nominated for a whopping seven awards in the upcoming FANtastic Horror Film Festival, including "Best Feature" and "Best Comedy". 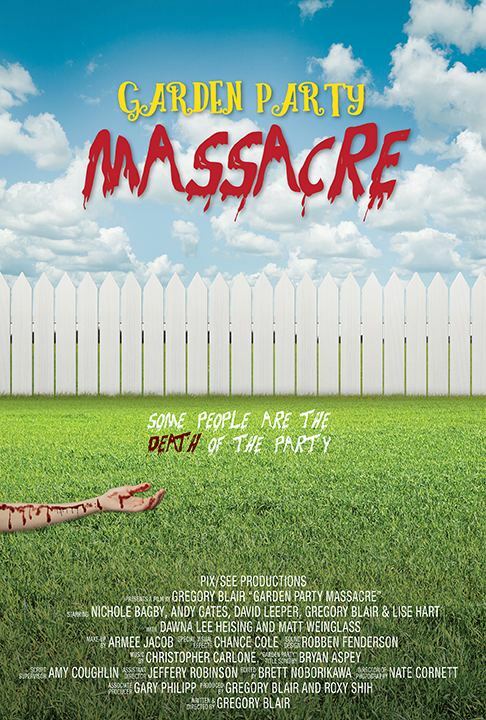 GARDEN PARTY MASSACRE is a PIX/SEE Productions film starring Andy Gates ("Grimm"), Nichole Bagby ("On The Rocks"), Lise Hart ("Deadly Revisions"), Gregory Blair ("Love That Girl"), Dawna Lee Heising ("Samurai Cop2: Deadly Vengeance"), Matt Weinglass ("Jimmy Kimmel Live!") and David Leeper.